This week has been tough, and I’ve needed more will power than ever before to get through it. The downsides to the week have included an exam that didn’t go too well, finding out some bad news about my legal case, and the Conservatives getting in to power again (and that’s all I’m going to say about politics). The upsides? Now that’s a tough one. Well, I registered the domain HollyPryce.com. It’s a part of a project I am working on. I’m trying to develop my coding and design skills further (I’m currently learning jQuery) and I want somewhere to showcase my skills. It’s a long-term project that I’m working on in my spare time, and although there is nothing yet on the website to show for it, I’m having a lot of fun. I bought a new curling wand so that I can curl my hair for my leavers ball next week. It’s been so long since I curled my hair, so I’m kind of out of practice. I’ve also bought some metal vented brushes so I can try and teach myself how to blow-dry curls into my hair. I’m seriously going to try more with my hair so that it isn’t just left in its natural state. 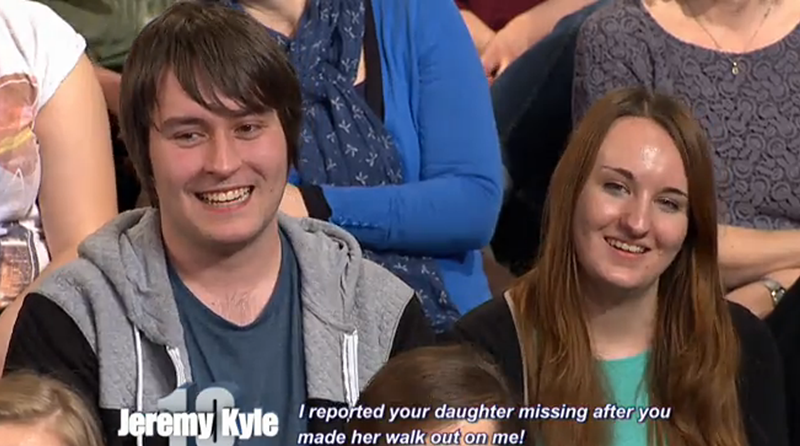 Tyrone and me made our TV debut, sitting in the Jeremy Kyle Show in audience. Please forgive my shiny face and tired looking eyes. We’d just queued for two hours to get in. We were laughing at someone who didn’t think chlamydia was an STI in this particular shot. We laugh a lot, even when we shouldn’t have been. My last ever exam is on Monday afternoon, and then I will have officially completed my degree. With the last exam I feel like it’s going to be impossible for me to get a 1st on my degree overall, but that’s okay. This year has been difficult for me. It’s crushed my motivation and my interest in geography, and I will forever believe that the formal education system is screwed. However, I have a degree and that’s all that matters. Next stop, a job to fund my travel dreams. Good luck with jQuery! I remember trying to learn that and I failed miserably! I’m sure you’re doing a great job, I’m excited to see what your new domain will hold! Good luck with your last exam. Hopefully you’ll get your first, but don’t worry if you don’t! You’ve worked so hard over the last three years! I’d probably apply for a job in geography if they existed, but unfortunately I’m really struggling to find a job that I can apply any of my geography skills too. So I’m broadening my horizons and basically applying for anything that involves sitting down at a desk with a computer! jQuery is tough! I can see why people who know it are so highly sought after! Good luck with your final exam! And I’m sorry you’re feeling that way about your education, but schools do have a way of killing our passion, as Sir Ken Robinson has stated multiple times! I think that’s cool you made a TV debut 😀 I don’t think I’ve yet to make it onto TV, and I hope I don’t! I so don’t enjoy having a camera pointed at me, especially when I’m not ready for it. I wish you luck with your new domain and the coding you’re trying to conquer. I’ve never tried coding with jQuery, and I doubt I ever will I learned early on that I am not meant for programming! Java alone killed me! Thank you. I’m not even sure how I’ve lasted this long in education!! Thank you. It was the best but at least it’s over and done with now. Good luck with your new project and exam! Thank you. I’m finding the job search mentally draining, but I’ve got to keep going.